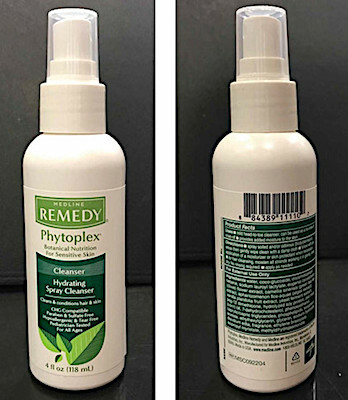 Canada/Ottawa: Medline Canada, Corp. a Milton, Ontario establishment, recalls an estimated 44,000 Medline Cosmetic products due to suspected Burkolderia cepacia contamination and consequential risk of gram negative bacterial infection and illness, all serious health hazards. Please consult the photograph above for details of the product’s packaging, design and retail presentation. Additional images of the recalled Cosmetics can be found on the Web site above. According to Health Canada, the recalled Cosmetic products may be contaminated with the bacteria Burkolderia cepacia. This bacteria can pose a risk of infections to people, especially those with weakened immune systems. Contamination of the bacteria has only been confirmed for the Remedy Essentials Cleanser No Rinse Foam. If you believe you have purchased or have in your possession any of the recalled Cosmetic products, please do not use them. Instead, kindly return the product to the store where you purchased it for a full refund. ==> Never depend on your senses of sight, smell, taste or touch to confirm Cosmetic poisoning or contamination. Is desired, disposal of any of these Cosmetic products must be in accordance with local municipal hazardous waste requirements to protect your personal safety, the local drinking water supply and the ecosystem. If you have any questions about this recall notification, please contact Medline Canada toll-free at 1-800-396-6996 from 7:00 AM to 7:00 PM, Central Time, Monday to Friday. Alternatively, you can e-mail the company at Canada-Orders@medline.com. Please note: the Canada Consumer Product Safety Act prohibits recalled products from being redistributed, sold or even given away in Canada. In addition, the Canadian Food and Drugs Act expressly prohibits the sale of cosmetics that are either made with hazardous substances, or under unsanitary conditions, to Canadians. ==> To see other recalls and notifications caused by suspected contaminated, adulterated or mislabeled Cosmetic products, please search for “cosmetic” using the Search Box at the top of this page. ==> To see all recalls and notifications relating to Bacterial hazards, please search for “bacterial” using the Search Box at the top of this page. ==> To see other recalls and notifications for products manufactured, marketed and/or sold by Medline Canada, Corp, please search for “Medline” using the Search Box at the top of this page.